In Alice Walker's book, The Color Purple, Shug stated, "I think it pisses God off when you walk by the color purple in a field and don't notice it." Well, we appreciate God's creation and chose purple for the color of our house. 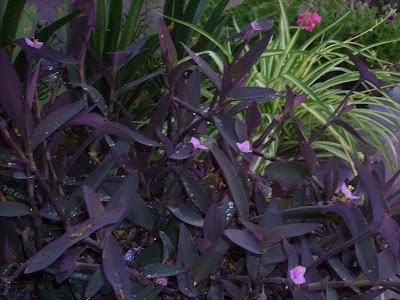 We have also chosen to place several different purple plants in our gardens. The Jacaranda tree in the front of the house produces beautiful purple blooms. Have we over done it? Naaaaaaaaaaaww.